Dolls are particularly popular among young girls. Dolls have been around since ancient times, allowing kids to make up their own stories and use their imagination. If you’re looking for the best dolls for girls, you’ll be spoilt for choice so work out your child’s interests first. Does your child love little babies? What about an interest in a particular career, like being a veterinarian or a firefighter. There are dolls for everyone. Dolls great Christmas gifts for young girls. Of course, the easiest go-to doll is any of the Barbie dolls. There are tons of different kinds of Barbie dolls available, with accessories that let your child customize them just about however they want to. ⇒ Want to see the latest Barbie Fashionista dolls? Click here to check them out. The best dolls for girls are the ones that your child can relate to. You can get Barbie’s with all kinds of different fantasy themes, like mermaids and fairies, as well as real life themes such as weddings and careers. For example, your child might want to grow up to be a doctor one day. 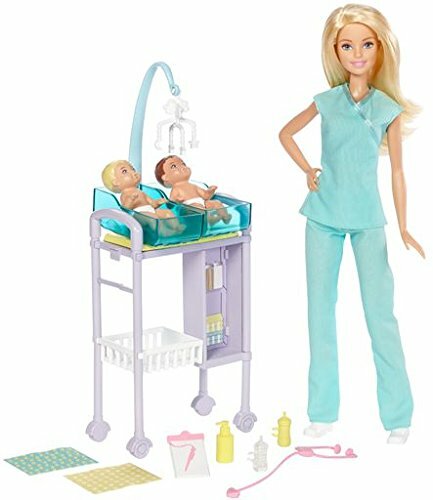 There’s a Barbie playset that dresses her up like a doctor, complete with scrubs, a stethoscope, a table, and two babies to care for. You can get all kinds of outfits for all kinds of careers, from fashion model to firefighter to pilot. When you searching for the best dolls for girls this Christmas, remember the accessories! There are tons of Barbie accessories available, such as the Barbie convertible. Your child can pretend that they’re driving Barbie around from her job to her house, and it even comes with seat belts to teach your kids proper driving safety. You can also get SUVs, Campers, and even an airplane. Of course, Barbie’s aren’t the only dolls out there. 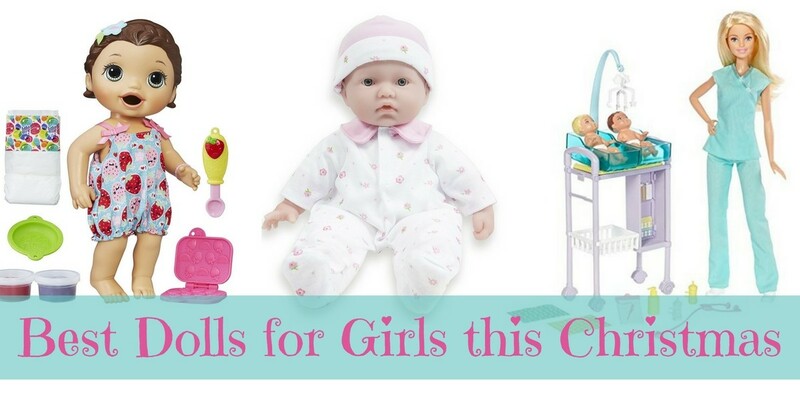 If you’re looking for the best dolls for girls, you really can’t go past baby dolls. They’re one of the most popular kinds of dolls out there. The La Baby from JC Toys is a great example, because it’s light, small, and comes in various skin tones. You can get little bottles that the doll can hold on to, which simulates feeding a baby in real life. You can also get strollers so your child can take them around outside. These dolls can teach your children compassion and nurturing, and can prepare them for how to hold a baby for real. One of the more advanced baby dolls on the market is the Baby Alive series. The Baby Alive dolls will all actually eat, use their diapers, talk, and in some dolls, move and crawl around. Click the image to see price and details. For some of the dolls, the food is reusable, but if your child loses it, you can always get more. You can also get your child replacement packs of diapers, so they can keep playing with their Baby Alive. The great thing about buying a doll for your child for Christmas is that you can buy little accessories for the doll as stocking stuffers. This completes the present. Alternatively, if your child already has a favorite doll you can buy a new outfit, a stroller or vehicle, or accessories as Christmas gifts this year. Dolls are great for encouraging kindness and nurturing. They can also be a source of comfort. With so many wonderful choices in dolls we hope you find the best doll for your child this Christmas. Yes, this really is a doll (above). Can you believe it? She’s so realistic, it’s hard to believe. This doll is also weighted correctly like a real baby. If you can afford one of these dolls it would be lovely to get one. As mentioned, they are collectors dolls but some parents have bought them for their daughter to play with. The only downside is that you have to be careful with the hair when playing because it is quite fine and delicate (like a real baby’s hair). ⇒ Click Here to see more details and the price on this realistic doll. This entry was posted in Kids Gifts on October 20, 2017 by Cindy. We are a participant in the Amazon Services LLC Associates Program, an affiliate advertising program designed to provide a means for us to earn fees by linking to Amazon.com and affiliated sites. There is no extra cost to you. Some products on this site are included in association with Zazzle and we will receive a commission if you purchase through our link. This will not cost you anything more than you would normally pay, there is no increased cost. We are a participant in the Society6 Curator Program. Some products may be affiliate links and we will receive a commission if you purchase through our link. There is no extra cost to you for buying through our links. 50 Best Gifts Under $50 (many under $20) – Christmas is almost here!